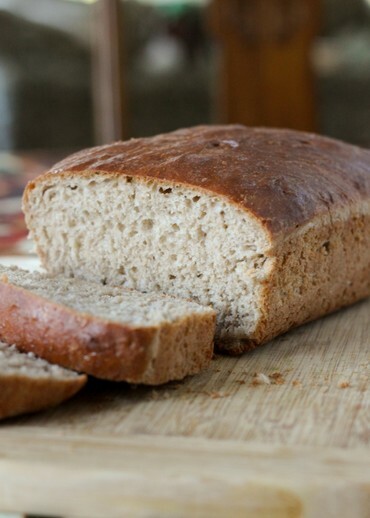 An easy to prepare whole wheat bread that requires no kneading! This recipe is featured at Rachel Cooks. Measure the first 3 ingredients into a bowl; blend. Set aside. Pour the water into a mixing bowl; add the yeast. Let stand 3 to 5 minutes; stir. Add the honey, shortening, and ½ the flour-mixture. Beat 2 minutes with electric mixer on medium speed, or by hand until smooth. STOP MIXER. Add the rest of the ingredients and beat again with a spoon until smooth...1 to 1½ minutes. Scrape down batter from sides of bowl. Cover. Let rise in warm place until doubled...about 30 minutes. Meanwhile, grease two 5 x 9- OR 4½ x 8½ - inch loaf pans. Beat down raised battter in about 25 strokes. This is a thick, somewhat sticky batter; spread evenly in the pans. Tap pans on table to settle the batter. Let rise until edges of batter comes to within 1-inch of tops of large pans or reaches tops of smaller pans...about 30 minutes. Bake 40 to 50 minutes. or until well browned on sides and tops, in preheated 375°F oven. Remove from pans and cool on rack. Brush with butter for soft crusts. This bread was awesome, and turned out perfectly baked! I added a few flax seeds into the dough for a bit of a protein oomph. This is my new go-to bread recipe.